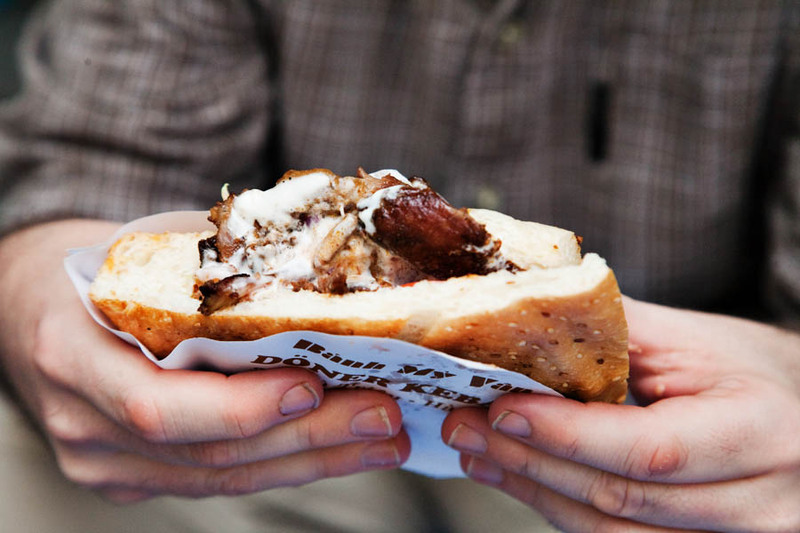 Bahn My: the darling sandwich & craze of the US foodie movement. If you read food sites such as Serious Eats you’d think there was no food more synonymous with Vietnamese cuisine than Bhan My… more so even than the beloved Pho. 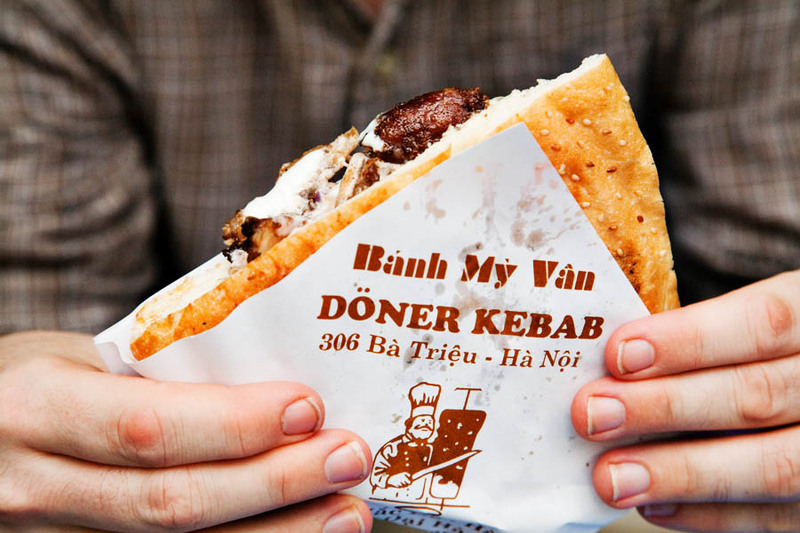 Is this hipster sandwich as prevalent in Vietnam as it is stateside? No. Could it possibly be as good as everyone says? OMG, YES! 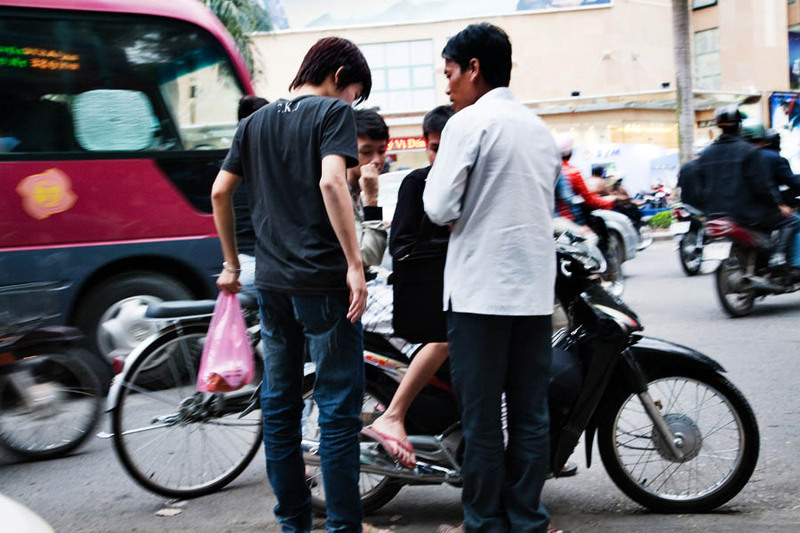 I landed in Hanoi with a short list of things to do. Bia Hoi (unpasteurized beer), Pho (duh), Bobby Chin (don’t really know why), and at the top of the list was Banh My. I’d read so much about it over the last few months… how people were following the carts that peddle the sandwich on Twitter, restaurants devoted exclusively to it. Was this just an American thing with little resemblance to the local reality? 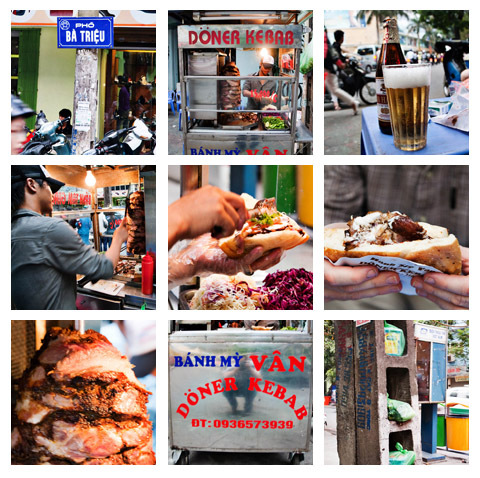 I did a quick bit of research and found a NYT article on Banh My in Hanoi. 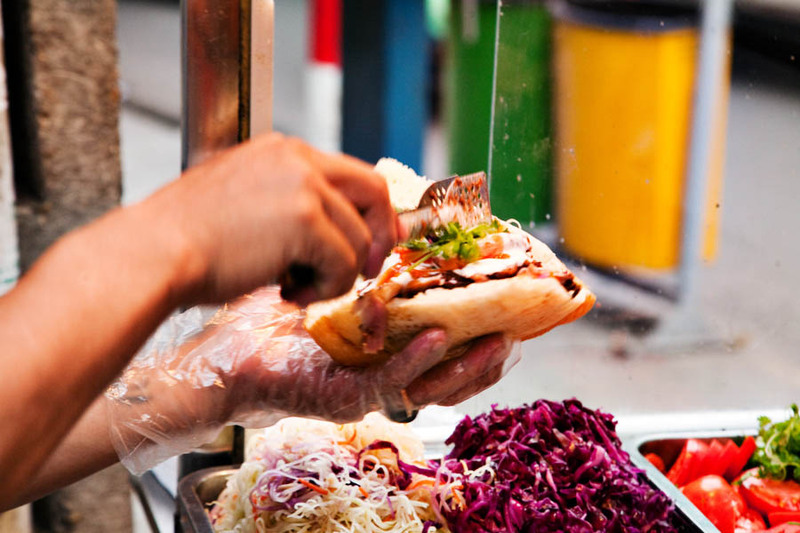 An unlikely variation on the sandwich is thriving in the Vietnamese capital: the banh mi doner kebab, which incorporates elements of a doner kebab, the Turkish staple, tucking shaved pork, pickled vegetables and chili sauce inside a warm baguette. 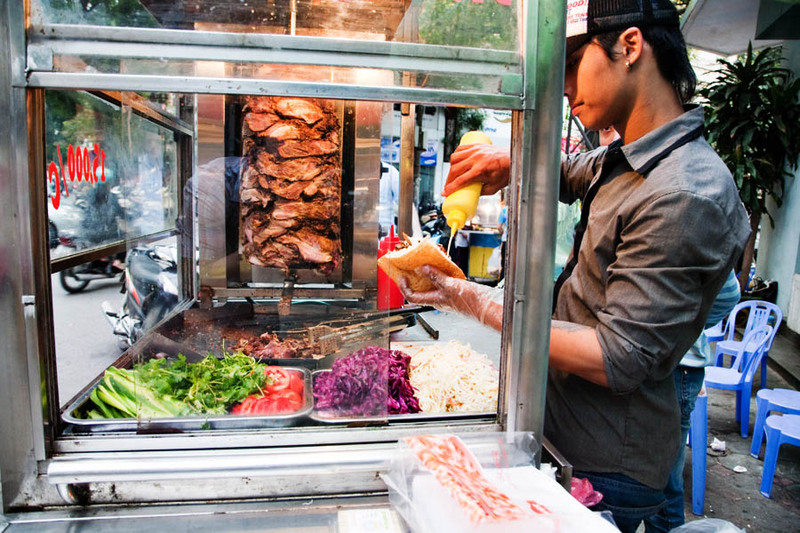 Turkish doner kebabs are usually halal, meaning pork-free. Is this version culinary sacrilege? Perhaps, but a tasty one. Sounded good. We didn’t have many meals in Hanoi proper (due to traveling outside of town as well) and so opted for the best in town… the article left out one small detail though. This Banh My is a food stand. Thankfully I dined with a well-traveled group (coincidentally most of our Sunday brunch crew) so copping a squat on kid’s sized chairs in the street was more enjoyable than sitting removed from the action in an air conditioned room. But this could put some off of the ordeal. We arrived and looked for the building address to find the following cart. 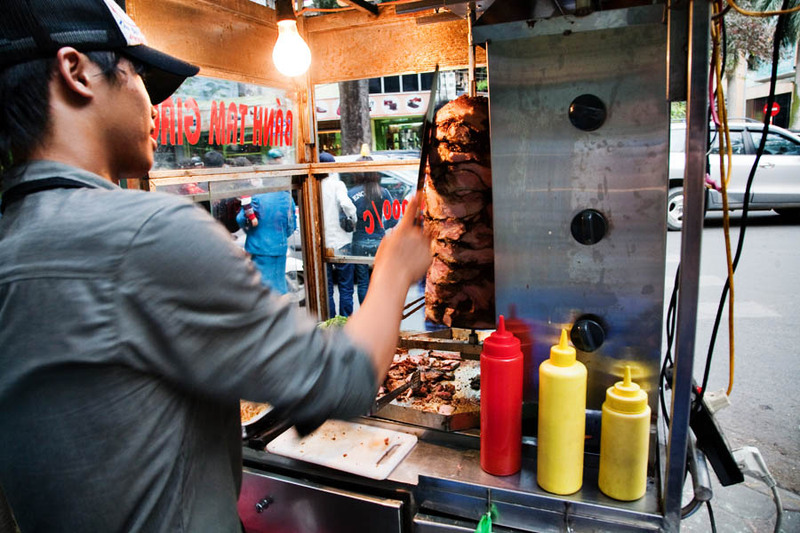 We watched as the sandwich maker quickly and skillfully carved the meat from the spit. We weren’t sure what the meat was at first though and so I sampled a piece to make sure it wasn’t lamb (some in our group don’t enjoy the gamey taste of lamb). It was pork… but that doesn’t do it justice. It was juicy, with an appropriate amount of fat, tender, seasoned to perfection… everything pork can be. I wanted to run off with the whole hunk of meat, but opted instead to patiently await the sandwich. The sandwich is stuffed with pork, red cabage, sweet slaw, cilantro, tomatoes, cucumber and heaping amounts of white sauce (a flavored mayonnaise) and red chili sauce. It should have been messier than it was, but held up in the sandwich nicely. After stuffing the sandwich undergoes a very secret, ancient technique for finishing which I’ll reveal at the end of the post. 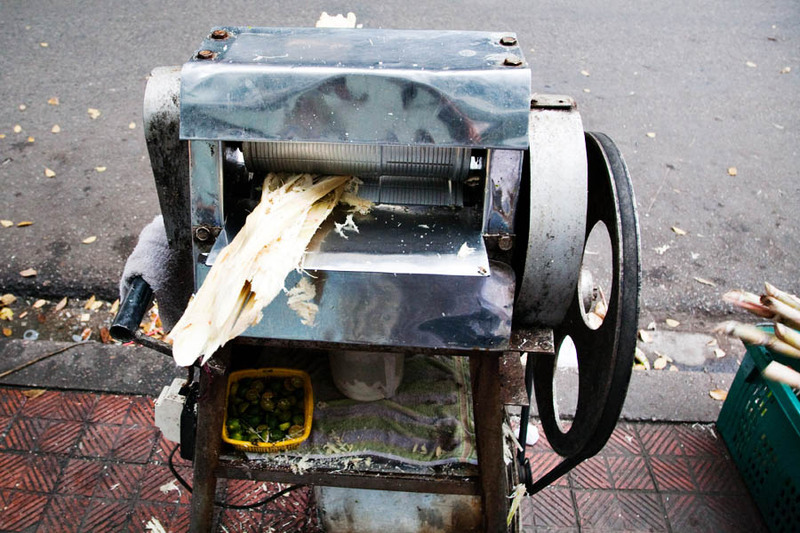 To wash it all down there’s freshly made sugar cane juice just around the corner if you’d like. But we had been walking a while… and sweat warrants beer. 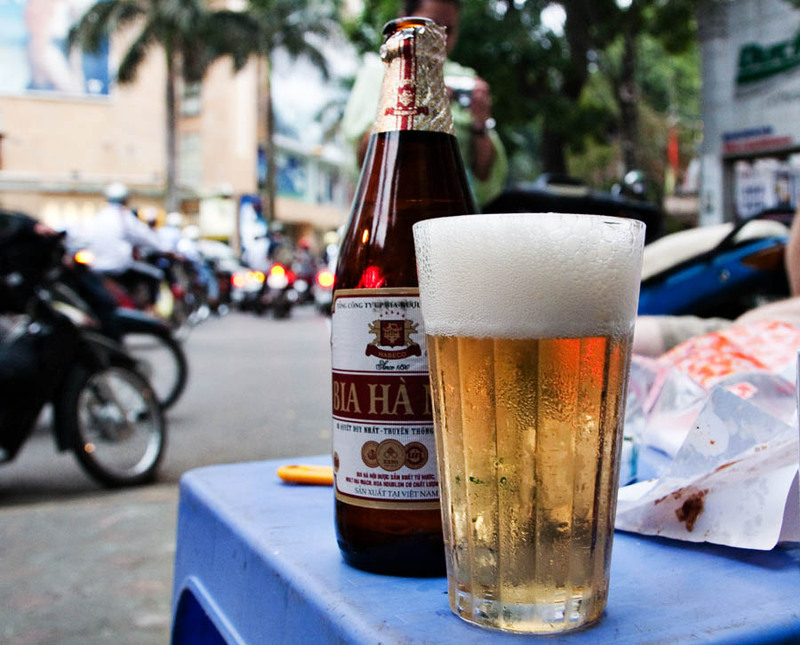 They didn’t have any on hand, but a nice old Vietnamese woman ran around the block to get us some Hanoi Beer (Bia Hanoi – not the same as Bia Hoi) and ice. I’m still not convinced ice belongs anywhere near a beer, but since she went through such efforts to get it for us I dropped a few in my glass. 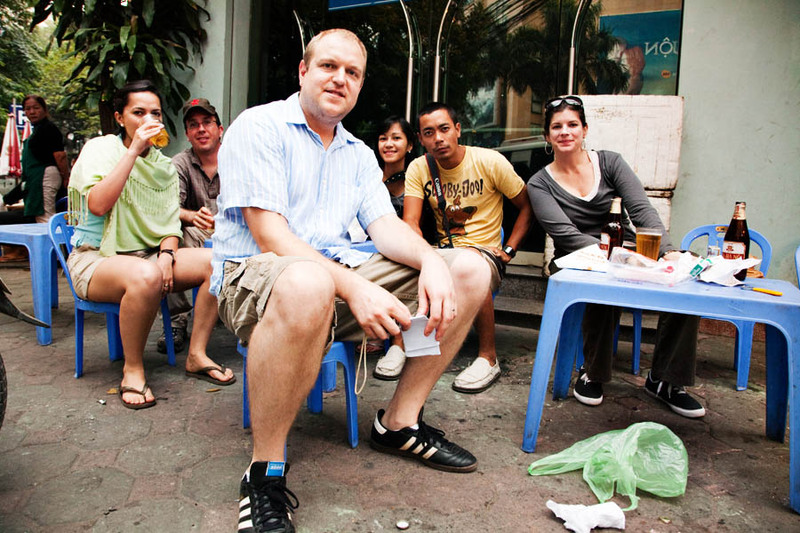 Eating Banh My on the street was easily one of my greatest travel highlights ever. It seems so silly, but it’s true. Our food vendor warmed to me when he saw my arm sleeve tattoo (he also had one). I communicated through a series of grunts and gestures and learned his English name was Michael. I wondered if he knew that his little stand was featured in the NYT? If he understood why all the white people would be coming by his little shop? We sat and watched a wedding going on across the street. 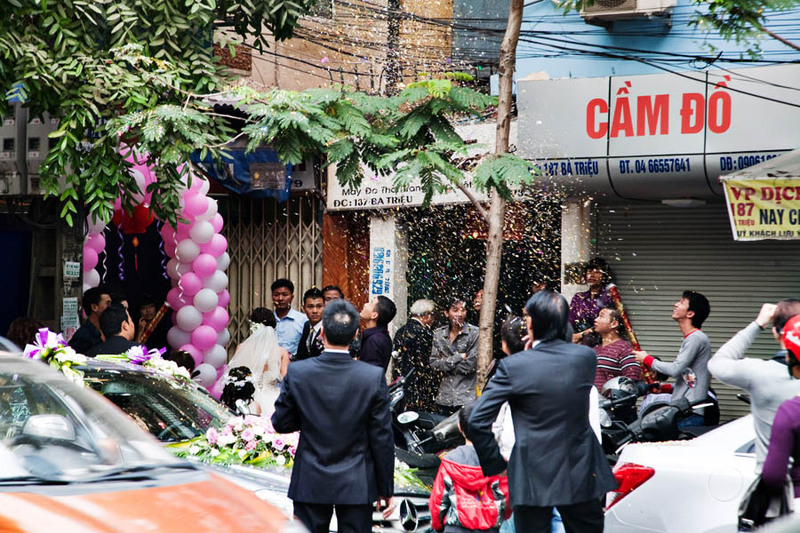 The families of the bride and groom exploded tubes full of confetti to announce the event and decorate the street as a reminder for those who walked past later of the event that had taken place. 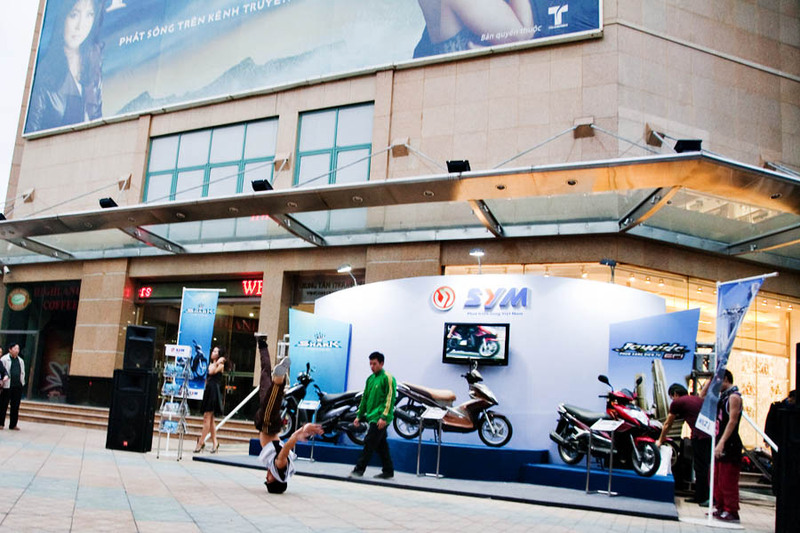 Across the corner a marketing team had hired break dancers to promote a new motorcycle in front of the local mall. 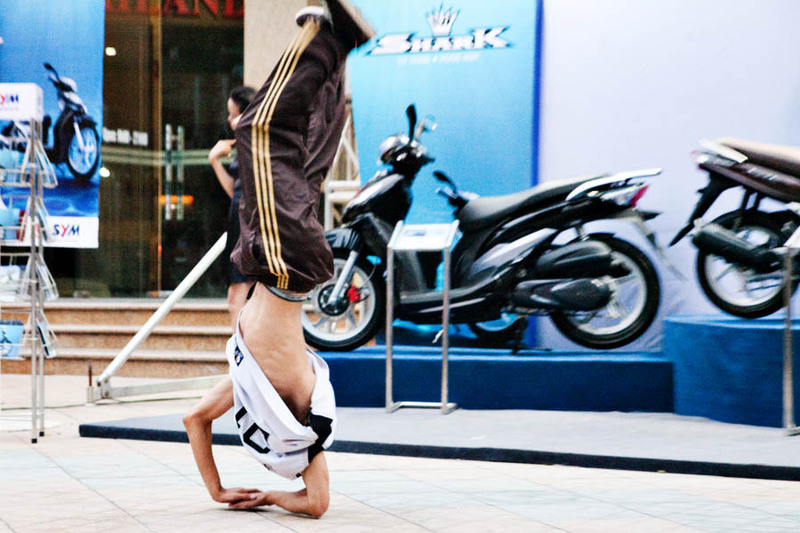 Yup, break dancers in Vietnam… I think my travel surprises have ended! I can’t say that our short trip to Hanoi gave us significant insight into the culture of Vietnam. I can say though that sitting there on that corner, sipping watered down beers, and sharing a cigarette with my new friend Micheal while watching the mix of ancient traditions juxtaposed with emerging commercialism… well I saw more there than I would have in a french restaurant geared for foreign tourists (though undoubtedly serving great food). 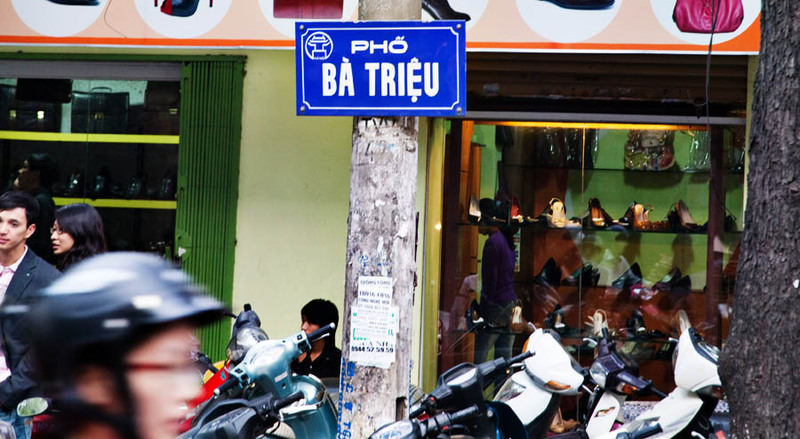 If you go to Hanoi. 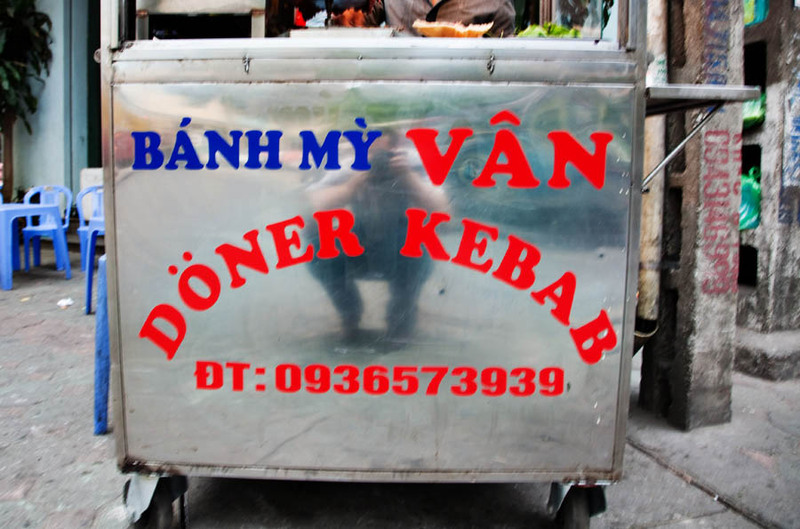 Get a Banh My here… and look for Micheal. I can’t recommend it highly enough. 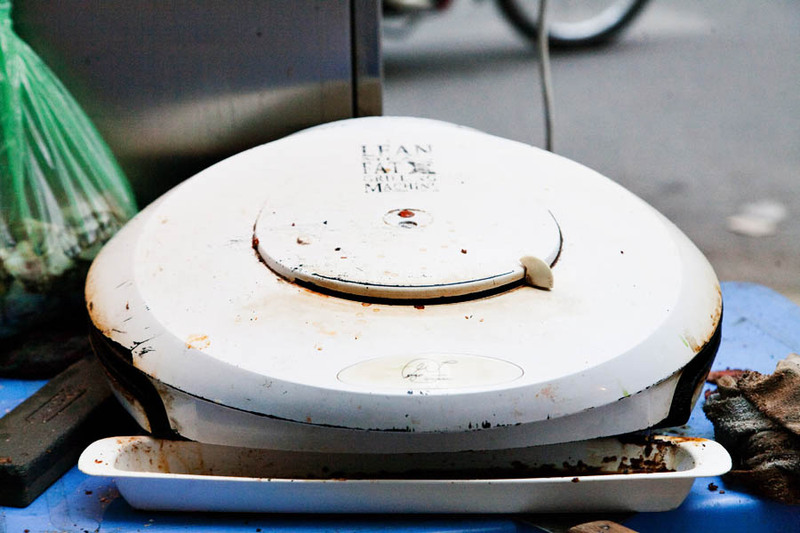 Bonus – The secret ancient finishing technique for a Hanoi Banh Mi.Ta Da! Also check out the uber-healthy condiment storage rack! Yup that’s mayo in that bag, out in the elements. 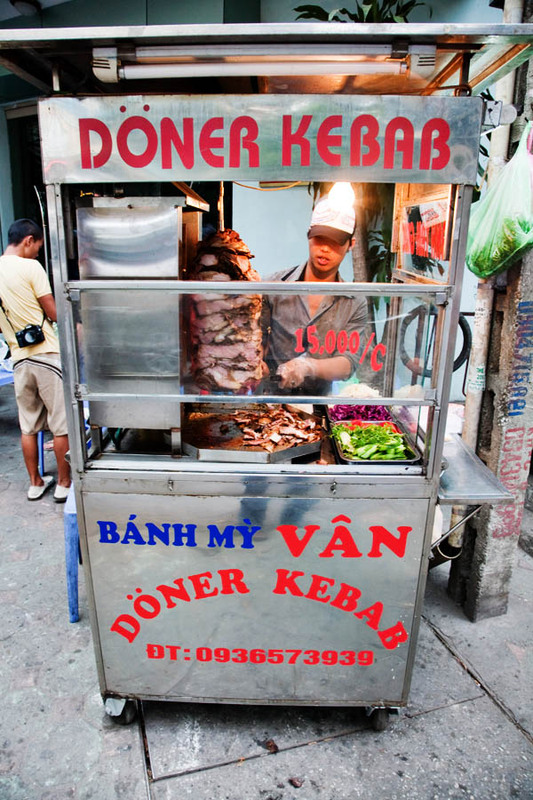 I saw one of these Banh Mi Kebab-style carts the other night on Hang Be and though it was well patronised I walked right by (granted I had already eaten a 4 course meal). Great to know that this phenomena produced worthwhile food, will put it on my list of things to eat in Hanoi. 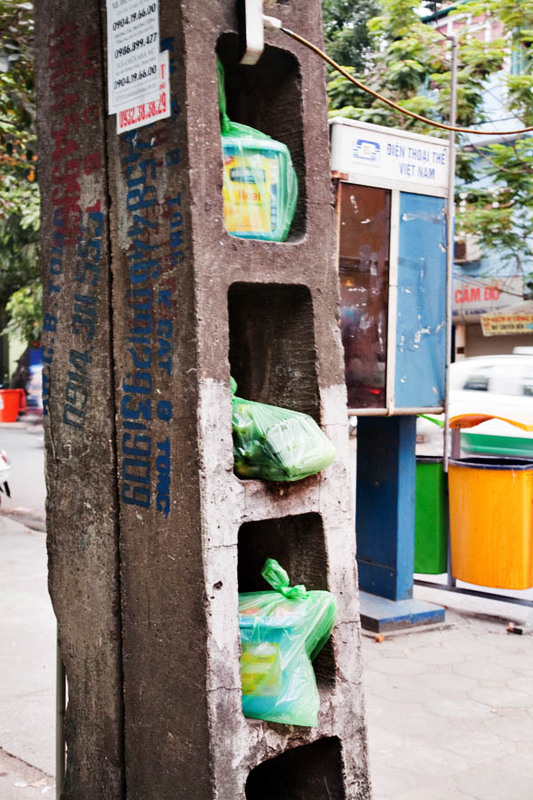 Great blog, just discovered it and in time too – about to book a little Bangkok holiday!